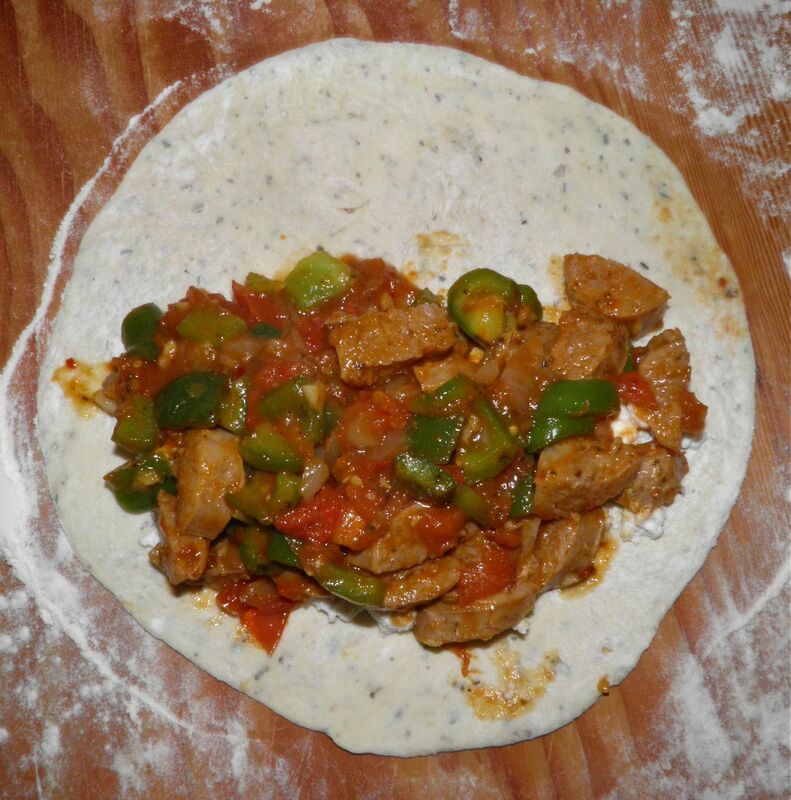 I'm always surprised how far you can stretch a pound of Italian sausage when you make calzones. 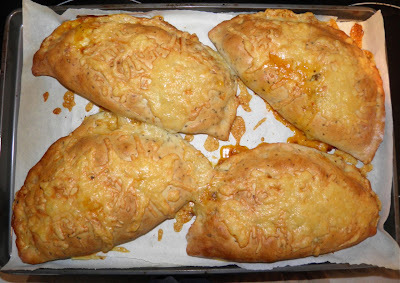 This recipe makes 4 fairly large calzones, enough for dinner for two fresh from the oven and two lunches of a half calzone each for our family. Or enough for 8 for lunch, if you serve a salad or other side. In case you don't know what a calzone is, it's an Italian "turnover" much like a pizza, but with the fillings closed up on the inside. See directly above. 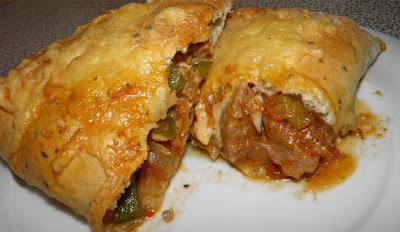 I felt kind of inspired to make these by the "pizza pockets" my spouse has been eating lately. They must be better (and better for you) if you make them yourself. For whatever reason I felt adventurous the day I made these. 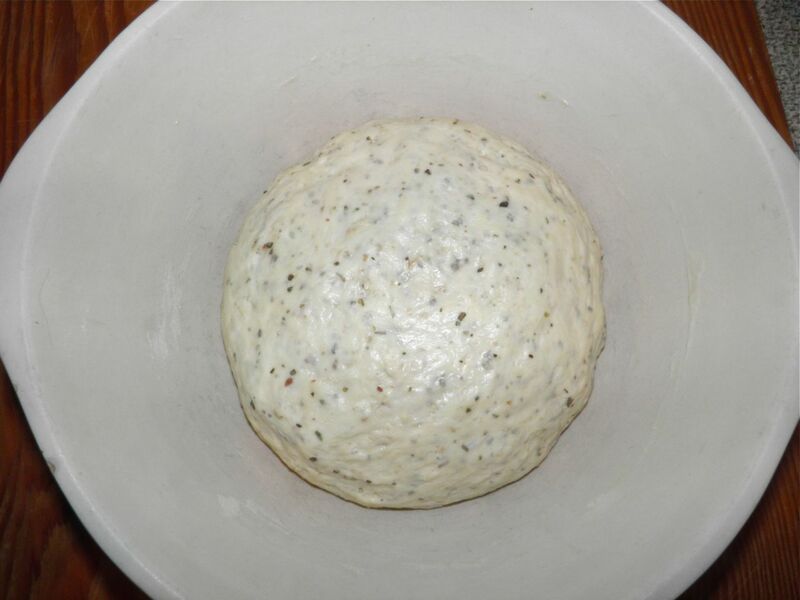 I put oregano in the dough. A tablespoon of dried oregano. It turned out quite nicely. I’ve put honey in before for a sweeter crust so why not. I may do this trick more often with other ingredients. I didn’t have any tomato sauce in the house. I subsequently found out they sell it at the corner store (remember I’m in the country) but by that time I had already made my own with whole plum tomatoes. Usually cooking down tomatoes takes a while. To break down tomatoes in a sauce quickly you need something acidic. In my case that was ketchup. Yes, ketchup. It’s surprising what you can make with just a few ingredients you have hanging around. I have to admit to a bit of a mistake making these. I was revelling in my calzones sitting on the baking sheet ready to go in the oven and looked across the counter at my mozzarella. I forgot to put it in the calzones. Whoops. So I grated it and sprinkled it on top, like a pizza. It worked and gave a nice melted bubbly crust. Maybe better than if it was inside the calzones. Proof the yeast for 110-15 minutes in the water. Stir in the flour, 1 tbsp of oregano and salt. 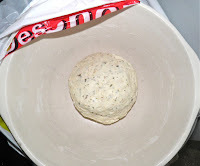 Knead in the bowl briefly and then cover with plastic wrap and a towel. Let the dogh rise in a warm spot until doubled, about 1 hour. Meanwhile, cook the sausages in a pan with a little water until the water has evaporated. Turn part way through the cooking time. Remove to a plate, let cool and then either slice or cube into bite-sized pieces. Sauté the garlic and onion in the oil in a wide saucepan. 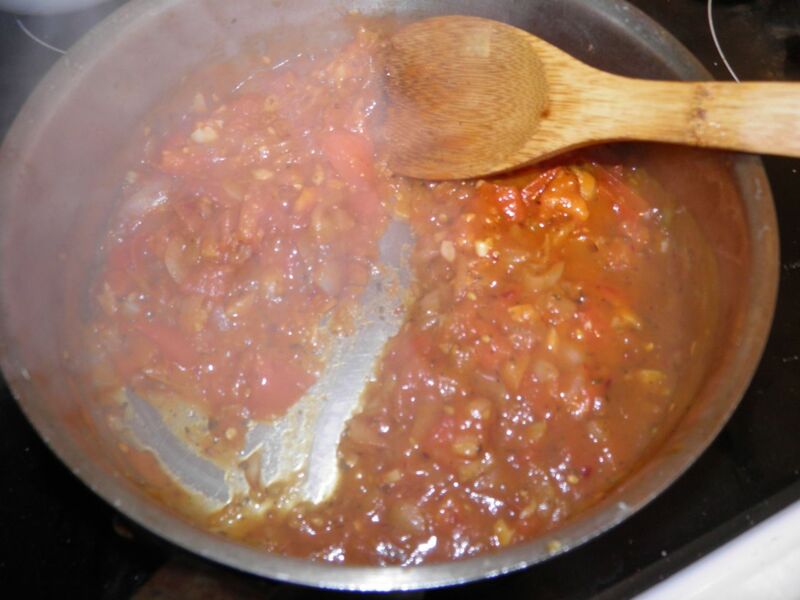 Once the onion has softened, add the tomatoes, ketchup and water. Cook, stirring occasionally, for about 10 minutes until the mixture is fairly dry and the tomatoes have broken down. Add the chopped green pepper and let cook in the sauce until the sauce reduces to the extent you can leave a dry trail in the bottom of the pan when you pull a spatula through it. You want the sauce to coat the green pepper, not be a liquid sauce. Stir in the sausage and add salt and pepper to taste. Take the dough and punch down. Divide into four equal pieces. Roll each piece on a lightly floured board into a circle about 9 inches (22 cm) across. Place 1/4 of the chèvre in the centre, followed by 1/4 of the filling. Fold the dough up over to make a turnover shape. Seal the edges by pinching together very well. Place each finished calzone on a baking sheet lined with parchment (for easy cleanup) and vent each calzone with three holes. Grate some mozzarella and sprinkle on top. Bake in the preheated oven for 25 minutes. 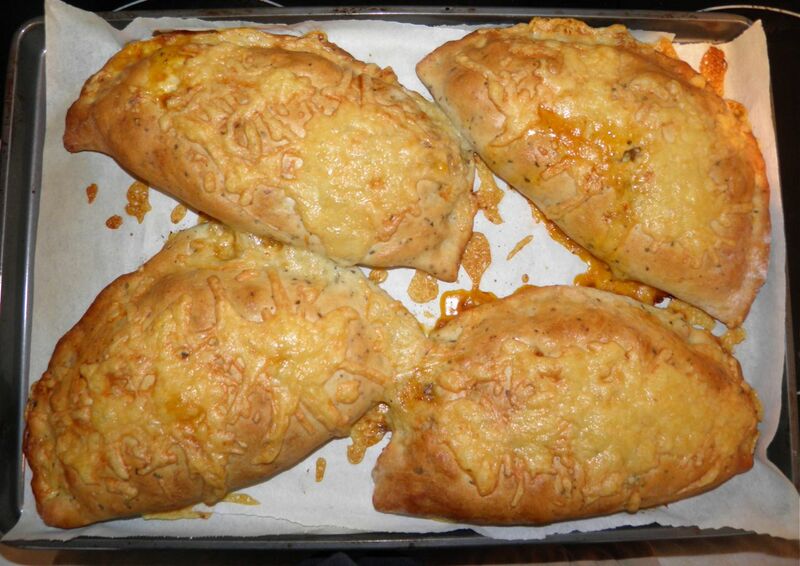 Allow the calzones sit for a few minutes before serving. The inside is very, very hot.